The Mission of the Osgoode Youth Association is to enrich the quality of life for youth in Grades 7 - 12 in rural south Ottawa. We are dedicated to harnessing our community to deliver a rich variety of programs aimed at social recreation, skill building, leadership, mental health, healthy relationships, physical activity and culture; supporting young people in their development as successful, independent and involved citizens. Mayor Watson calls O-YA the "gold standard of youth centres in Ottawa". In 2017, 1,799 unique individuals visited O-YA. 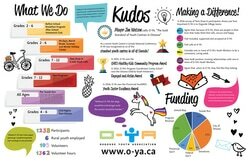 In 2017, O-YA was very grateful for the time and talents of 158 volunteers (both youth and adults) who contributed a combined 1,283 hours to our programs and services! In 2002, a group of community minded rural residents lead by CROP (Citizens Restoring Osgoode Parks) began the process of building a youth centre that would target the needs of rural youth. CROP’s vision was to establish a community based youth and family centre offering assistance to families and barrier-free access by teens to a safe gathering place, and a rich array of activities and services supporting their development as successful, independent adults and involved citizens. For the next 5 years, the youth group met on Thursday nights in a small room in the Osgoode arena. The enthusiasm and participation of these youth was the deciding factor in searching out a new home and making O-YA a hub in the rural area. In February 2006, O-YA opened its doors in the newly refurbished old Fire Hall. It was a mission fraught with many battles, but the vision of O-YA withstood any objection and the job slated to be a half a million dollars was accomplished for $85,000. Over 300 volunteers participated in this project, and O-YA is now a shining example of how community collaboration and one vision can become a reality. “While it may be difficult to measure the true value of the Osgoode Youth Association, I consider its presence in our community to be priceless. O-YA is a model facility with programming that should exist in every community. The organization runs a wide range of programs to serve a variety of needs. I am very glad and relieved that these particular programs [After School Homework Club and Teen Drop In] are offered so that teenagers living in our community have a place to go, as an alternative to unsafe and unsavoury locations. We did attend and very much appreciate an information night held for parents on drug and substance abuse. These sorts of educational and support programs for parents are helpful, if not essential, and it is important that such programs are available locally. I also signed my two children up for the guitar lessons and dinner program ... the concept was novel and a great way for kids to learn an instrument. Another stellar idea that they’ve implemented is cooking instruction whereby adults with a flare or talent for cooking come to the centre and teach kids how to prepare a specific meal (e.g. lasagna). The ability to cook healthy food is a vital life skill, and in an age where Home Economics is no longer taught in schools and where fewer and fewer people have this capability, O-YA is filling a significant gap. “This is a letter to shout out my support to the Osgoode Youth Association. O-YA has been an outstanding addition to the Osgoode Community and beyond. I have seen this demonstrated from the perspective of a parent of one of the youth workers. My son and several of his friends have worked with O-YA from the time of its earlier beginnings, up until very recently under the supervision of Nicole McKerrecher. They benefitted as they assumed responsibilities for children and teens of all ages, and from helping to design programming, learning to brainstorm together and then administer their ideas successfully. They grew in confidence and maturity, beginning to recognize some of their own strengths and weaknesses as they guided and advised those younger than themselves. They also learned how to seek out resources from the rest of the community to aid where they couldn’t do tasks alone. They developed networks of volunteers and knowledgeable persons that will surely last into adulthood. “As a founding member of the Osgoode Youth Association, I have followed with great interest and satisfaction the organization’s progress over the years. Drawing on services from the wider community, such as CHEO’s excellent Youth Net, as well as community volunteers, tasked with conducting cooking classes and tending O-YA’s kitchen garden for example, the Osgoode Youth Association has more than achieved its original vision of supporting the mental and physical development of local young people. With initiatives like the recent debate by candidates for municipal council held by O-YA for youth, civic engagement and responsibility are promoted. In 2000, when O-YA was first formed in response to documented high levels of depression and substance abuse, as well as community concern over issues of vandalism, theft and boredom amongst local youth, the motto ‘Village Raised – World Ready’ was conceived. After eight years of concerted effort by hundreds of volunteers, the O-YA Centre with exterior skateboard park and basketball court was opened to youth 12-18 in Osgoode Ward. To combat the lack of public transportation and other opportunities in our rural communities, the O-YA Centre brings a wealth of experiences and services ‘to’ our youth and takes our youth ‘out’ to the wider community for new experiences. Examples of the latter include cultural outings to the National Arts Centre and this summer’s “bustin’ out of town Trip Tuesdays”. Community-based and independently operated, O-YA is attuned to the needs of local teens and can respond nimbly to meet those needs. It operates a popular after school program with tutoring for younger schoolchildren in recognition of the longer commute faced by parents living in rural areas. Younger children are also introduced to O-YA gradually via the mechanism of special “Chill Nights” targeting those in grades 4 to 6. Without a doubt, O-YA enriches the lives and broadens the horizons of the children and youth it serves directly, including my own four children now successful young adults. Perhaps more importantly though, O-YA positively impacts the lives of all our children who understand that they live in a community deeply committed to their wellbeing and future success. In a world where young people are increasingly unmoored and, in more extreme cases, drawn to radicalized views and gangs for the sense of community these provide, it is no small thing we offer here in Osgoode. “The Osgoode Youth Association provides valuable services, resources, programs and experiences to youth in Osgoode and surrounding area. In our rural area with no public transportation there are limited options for youth, particularly those who do not have access to transportation out of the area. O-YA provides opportunities for our youth to experience events such as Winterlude and Saunders Farm by organizing bus trips for youth. O-YA also works to provide education regarding healthy lifestyle such as healthy cooking lessons and self-esteem workshops. The annual O-YA run highlights its efforts in our community to model that healthy lifestyle with families joining to support the youth center by running or walking the 2, 5 or 10 K route.